Even though ballet as a form of art dance is nowadays celebrating almost its fifth century of existence, ballet in Slovakia is considered to be only a young art genre. Of course, 95 years is a respectable age, but not in Slovak ballet. Some time ago I wrote: ‘We could say that ballet belongs among the newest of artistic performances which has obtained residency on our theatrical stages. It is only natural that this process has not been simple or easy, which applies to the whole existence of this artistic form of dance, including the formation of independent ballet companies or other bodies, conditioned by the existence of the appropriate number of skilled dancers, or including the search for artistic choreographers at the necessary level who would prepare the basic repertoire and extend it to other dance works…’ (Emil Bartko, ‘The Centenary of Czech Theatre’, Common endeavour in dance art, Tatran, 1983). This may seem strange when we realise the proximity of Vienna or Budapest. Unfortunately, it did not make the beginnings of Slovak ballet any easier. 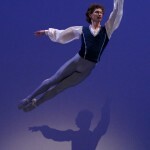 It cannot be strictly said that ballet did not occur in Slovakia in the past, at least where Bratislava was concerned. In the 18th century ballet dance already formed part of major festivities or opera performances at aristocratic courts as well as in Bratislava Castle. In the 19th century, various opera and ballet companies (mostly from Vienna and Budapest) visited Slovakia with their touring performances. Even the opening in 1886 of the new Town Theatre building in Bratislava, today’s Historic Slovak National Theatre Building, did not bring the establishment of an independent corps de ballet, which could have had a positive effect on its future development. In the end, the history of Slovak ballet began to be written on the historical date of 19 May 1920, after the foundation of the Slovak National Theatre. Before I address myself to the beginnings of Slovak ballet, we should again remind ourselves that the proximity of respectable centres of ballet in Europe of that time, Vienna and Budapest, paradoxically did not have any influence on the development of ballet; perhaps this was only a direct consequence of the cultural and political situation at that time. The foundation of the national theatre in 1920 also invoked activity directed towards the origin of the theatre’s own ballet company. But there was another question to be answered. Where to take artistic dancers from? After the disintegration of the Austro-Hungarian Empire, and as a consequence of there being no existing ballet school in Slovakia, there was only one possibility: to call upon Czech dancers and choreographers to come to Slovakia. This started the following intensive, 40-year tradition of co-operation with Czech dance artistes who were gradually followed by an increasing number of Slovak artistes. This co-operation culminated in 1961 when Slovak choreographer Karol Toth was appointed to the position of Artistic Director of the Slovak National Theatre Ballet Ensemble. Of course, this co-operation between Slovak and Czech artistes has continued ever since. The history of Slovak ballet may be split into several periods which relate to each other.